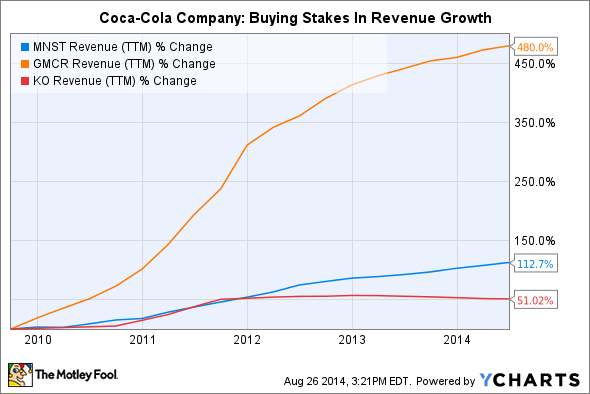 The Coca-Cola Company's stock has lagged the market woefully during the last 12 months. Here's why the next 12 months could be different. The "mini can" saw double-digit volume growth in the second quarter of 2014, contributing to brand Coca-Cola stabilization. Source: Vox Efx Vox Efx under Creative Commons license. Has The Coca-Cola Company (NYSE:KO), in the manner of a marathon runner at mile 20, where the body is said to throw up its greatest resistance to finishing, "hit the wall"? Coke's revenue growth has wilted in the last two and a half years, as sales of the company's signature Coke soft drinks have barely budged because of consumers' evolving preferences for healthier refreshments. Sales declines have also tarnished superbrand Diet Coke, as worries over the use of the chemical aspartame have caused legions of fans to rethink their loyalty. Not surprisingly, during the last 12 months, Coke's stock has risen a mere 8.7%, slightly more than one-third of the S&P's solid gain of 22.5% over the same period. "Brand Coca-Cola," which includes Coke, Diet Coke, Coke Life, and all variants, is the mainstay of the company's sparkling brand portfolio, which in turn comprises 74% of KO's unit case volume. Few dispute that Coca-Cola must reinvigorate this mainstay of its business model. In light of what seems a global trend toward healthier beverage consumption, Coke's non-sparkling, or "still" portfolio, which includes bottled teas, coffee, water, juice, and energy drinks, is increasingly vital to the company's future success. In 2014, management has acknowledged its current state by articulating a simple roll-up-the-sleeves strategy: to "accelerate sparkling growth, led by brand Coca-Cola," and to "strategically expand [our] profitable still portfolio." The following are three reasons management's focus on these two priorities may change the fortunes of Coca-Cola's stock over the next 12 to 24 months. A foundation of the beverage titan's drive to "accelerate sparkling growth" is its intention, announced in February of this year, to spend $1.0 billion in additional marketing by 2016. The increase appears to have already affected results, as in the most recent quarter, extension of the "Share A Coke" campaign was cited as a support for brand Coca-Cola sales, and the company also managed 3% worldwide volume growth in the quarter. Marketing spend rose by mid-single digits in the second quarter of 2014, according to newly installed CFO Kathy Waller. While Coke doesn't break out the exact amount of its marketing expense, the increase is apparently incremental, and will likely be absorbed by productivity improvements, as management indicated when they first introduced the new tactic. Indeed, while revenue declined during the first six months of the year by 2.6%, gross margin actually improved by about six tenths of a percentage point. Coca-Cola's leaders like to say that they are "accelerating" brand Coke's sales, yet current energy is really devoted to stabilizing the brand, even at a 1% growth rate. As we'll see in the following section, there is plenty of rationale to simply hold the line on brand Coke sales for now. "1 Lohas," one of three international premium water brands growing at a double-digit pace for Coca-Cola in 2014. Source: Coca-Cola Japan. Overall revenue trends may have been anemic as of late, but they'd look much worse without the contribution of still beverages. Coca-Cola's non-sparkling beverage volume globally has increased 6% in the first two quarters of 2014. This is three times the rate of the company's overall volume growth rate in 2013, and six times the paltry 1% increase in sparkling beverage volume growth globally in 2013. The company's success in still beverages is driven both by brand investments and the popularity of soda alternatives in much of the developing world. Coke has benefited, for example, from investments in Dell Valle and Maaza juice brands in Latin America and Asia, respectively. The company has 11 "billion-dollar" still brands in its arsenal, and CEO Muhtar Kent promises that there are "many more in the pipeline." Since still beverages only make up 26% of unit case volume globally, it would take seven years at the current growth differential for these non-sparkling beverages to make up even one-third of Coca-Cola's total annual volume. But if the company grows the still portfolio slightly faster, at an 8% growth rate, and maintains sparkling growth at 1%, still beverages will account for one-third of total volume in just five years. How does Coca-Cola benefit from the difference in these rates? Decreasing the influence of brand Coke on its overall business by growing other segments while holding Coke sales steady allows Coca-Cola to control its destiny. Otherwise, consumers may decrease the influence of brand Coke for the company -- by simply purchasing less of it. While Coca-Cola is a serial purchaser of small companies like Honest Tea, and makes consistent investments in its bottlers, it's been years since the investment community has seen Coke pull out the type of ready-money it's committed in 2014, between its forays into equity purchases of Green Mountain Keurig and Monster Beverage Company. At the end of 2013, Coke's total investments in bottlers and other beverage companies stood at $11.5 billion. In the first eight months of 2014, between cash already paid and commitments to purchase additional shares in Green Mountain Keurig and Monster Beverage, Coke has transacted $4.5 billion, or nearly 40% of its total equity investments at year-end 2013. MNST Revenue (TTM) data by YCharts. More importantly, these investments are of enough size to drive future results. For example, Coca-Cola's investment in Monster Beverage will be recorded under the "equity method" of accounting. This portion of Coke's balance sheet contains its investments in its bottlers -- sizable companies in their own right, including Mexican bottler Coca-Cola FEMSA and European bottler Coca-Cola Hellenic. In a single transaction, Coke's $2 billion-plus investment in Monster Beverage will equal roughly 20% of the $10.9 billion Coke has invested under this method. The net result is that we may see even higher growth rates out of the still portfolio. As a bonus, such large-scale investments have the potential to construct an earnings safety net under the company in the coming years -- just in case brand Coke sales decline further. For Coke investors, the stock's stagnation is driven more by concern over the future than its current operating results. After all, Coca-Cola continues to deliver enviable profit margins (18.2% through the first six months of this year), and its ample dividend currently yields 3.1%. Shareholders want the company to fix its current trends to support a decades-long investment thesis: that Coca-Cola stock is a premium vehicle to safely park money and watch returns accrue. Coke's management has a desire to prove just that, and it's very possible we'll see the stock begin to appreciate again within the next 12 to 24 months. Within that time frame, the investments Coke is making in other brands, along with marketing investments in its flagship soft drinks, should show their first tangible results.